The dashed black line shows the approximate border of Lindon at the end of the Third Age, but in its earlier history, it had extended to the east of the Ered Luin (as shown by the dashed white line). The Emyn Beraid (Tower Hills) were considered an outpost of Lindon, but did not fall within its borders. The green land to the west of the Blue Mountains; the only region to survive the destruction of Beleriand during the War of Wrath. Gil-galad, last High King of the Noldor, dwelt there during the Second Age. There is strong evidence that the name 'Lindon' was applied to this region during the First Age, though 'Ossiriand' was the much more common name in those days.  It only emerged as a 'political' entity at the beginning of the Second Age, though, hence the entry in the Tale of Years for the year 1 of the Second Age: 'Foundation of the Grey Havens, and of Lindon.' (The Lord of the Rings Appendix B, The Second Age). 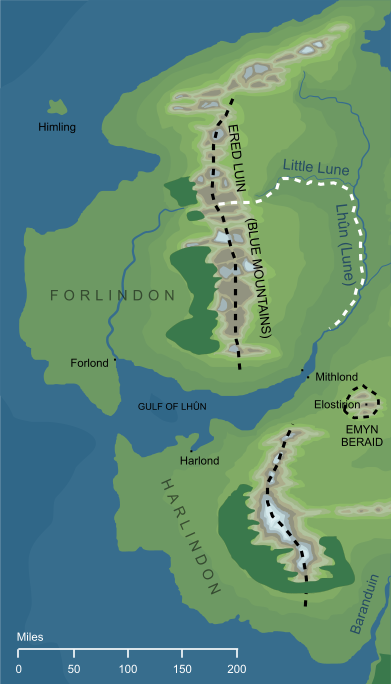 During the first half-millennium or more of the Second Age, Lindon was the most important Elvish nation in Middle-earth. Most, and probably all, the Elven survivors of Beleriand dwelt there for at least some of this period, making for a rich cultural mix. We know that this included Noldorin exiles (especially from Gondolin, but also from the Houses of Fingolfin and Fëanor), Sindar from Doriath and from the Falas, and almost certainly representatives of the Laiquendi, the Green-elves who had occupied Lindon during the First Age. This name comes from the singing of the Laiquendi, the inhabitants of the land during the First Age.